This is bedding that will work for all beds. Crafted with excellence, The Leaf Matrix Collection provides the beauty required in all bedrooms. Snow for your sims! NOTE: This is not flooring, you will find it under terrain. A Gem Wallpaper to match your set, finally! A beautiful carpet to match your sim's Gem collection. Matches the Gem bed. Nice, green, and modular. Works on the two curtains shown below. This is bedding, not a bed. These sheets will be available in all beds in this one download. Whether single or double, your bed will have these sheets. Real cool pattern, looks great with the modular beds. Updated! This is the better version. This is the moderate fridge, which most of ya'll know as the shiny expensive one. 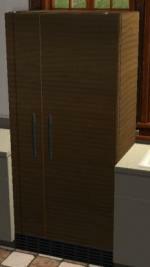 You can find this texture under that fridge with all the other colors. This is my first trial. Put in your downloads folder. For so long we have been plagued with a hideous bay window that tends to give a commercial feel. Those nosy Tennibauers from nextdoor snootily march on into your home with a simple glance at your bay window... giving them the expression that your home is the local Neimius Macruirius store. No longer worry anymore. This beautiful piece of elegance rids of the nasty border of servitude. Now your home can be free. Go with the Vista. This was the outfit I created for the contest. It is really nice as it includes the shirt, necklace, choker, and jeans. Sorry Lucy not included, outfit only. This is a set of Shirt (which has a necklace) and a Skirt (which includes formal shoes). This is the mean green set and is perfect for those women ready for the next century. The strapless shirt and vivid green skirt tells those hungry sim guys to back away. So turn on your fashion, cause those sim guys will be drooling after you home.